The yearly revenue from global solar panel installations is expected to be more than $151 billion (£96.7bn) by 2024. That’s according to a new report which forecasts the cost of solar panels to fall and potentially replace other energy technologies. The report suggests the solar market will increase in competition and expects this to be an incentive for businesses to own their supply chain, encouraging mergers between companies and stimulating growth. 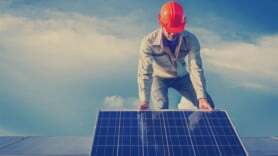 Proposals to reduce support for solar and biomass projects in a bid to keep household bills down were set out by the UK Government earlier this week. Following the announcement to scrap onshore wind subsidies, Alan Whitehead MP from the Energy and Climate Change Committee said both onshore wind and solar “will still be viable”.